Film in concert is an interesting concept of watching a movie with a live orchestra playing all the background music. 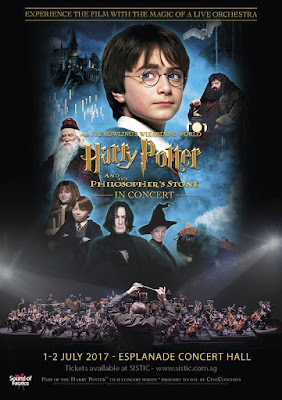 I watched Harry Potter films for several times and out of all the music, perhaps only the main theme song and Hedwig's theme are really legendary. Ultimately, I decided to spend the money just for the experience and possible concert memorabilia. I googled and overseas, they are selling programme booklet, wands, butterbeer, chocolate frog, etc. For someone who is still wishing to visit Wizarding World of Harry Potter, the thoughts of able to try butterbeer and getting merchandises are exciting. I arrived an hour before and I was disappointed to find that there was NO concert merchandises whatsoever. I overestimated the screen size and height and a seat at the top level was actually too high. Although it was tiring for my neck, it answered my curiosity on how the concert was made possible. I found it intriguing that the orchestra would be playing non-stop throughout the 2+ hours movie and how they could keep track when to play at which scenes etc. The conductor had a tablet in front of him, on top of the usual score, to help him. There are actually some parts in the movie that there is no music at all and the orchestra can take a short break. During these breaks, the conductor's tablet will show the movie. When it is time to play again, it is actually like a rhythm game and the tablet will turn black to give signals when to start playing and when to pause. I find everything to be quite underwhelming. The orchestra played so well and it did not feel like watching a concert. Everything was quite smooth that it felt like watching a movie. That is like a double edged sword since it made the whole thing a super expensive movie experience for $109. At the beginning of the concert, the conductor tried to hype up the audience by asking who belong in which House etc. He also mentioned for the audience to feel free to clap, cheer, or jeer at their favourite movie scenes instead of purely treating this as a concert experience. Unfortunately, throughout the show, there was little interaction with the audience. He also mentioned for the audience not to go home immediately after the movie was over because there would be a surprise form the orchestra but I did not see any surprise leh..